Robert G. "Bob" Wright, age 75 of Jasper, IN, passed away at 3:45 p.m. on Saturday, July 14, 2018 at Memorial Hospital and Healthcare Center in Jasper, IN. He was born in Jasper, Indiana on October 5, 1942 to Joy and Marie (Atkins) Wright.He married Jane Whelan on August 15, 1962.She preceded him in death on December 3, 2010. 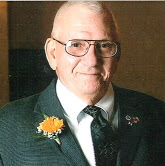 Bob was a Sergeant in the U.S. Marine Corps and served from 1960-1968. He was a graduate of Vincennes University. He retired from Masterbrand Cabinets as a Quality Control Manager. Bob was a member of St. Joseph Catholic Church in Jasper.He volunteered on the Spirit of Jasper Train and for the Jasper Mill.He was a past member of the Jasper Planning Commission and the Zoning Appeals Board. Surviving are five sons, Robert "Bob" Wright Jr. (Angie), Crown Point, IN, Doug Wright (Karen), Newburgh, IN,and Kevin Wright (Debbie), John Wright, and Mike Wright, all of Jasper, twelve grandchildren, three great grandchildren, one sister, Verla Summers (Jim), Jasper, one brother, Bud Wright, Montana. Preceding him in death beside his wife were his parents and one brother, Bill Wright. There will be no visitation, burial will be at a later date at Fairview Cemetery in Jasper. Memorial contributions may be made to the Dubois County Humane Society.